•	To encourage children to become actively involved in conservation and to foster an environmental ethic in children which they will carry with them throughout their lifetime. •	To draw children and their parents to EKZNW Camps and Reserves. •	To use it to grow the Rhino Club. Eco-tourists to the Ezemvelo KZN Wildlife protected areas see many exciting things, but so do you – in your own garden, or in the Park near your home, where there are equally fascinating and necessary creatures like spiders, ants, earthworms, lizards and rodents. We will explore the environment with you! 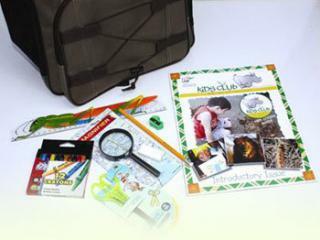 Our inter-active Activity booklets help kids to discover many fascinating facts. Find out how a small hornet manages to catch a spider twice its size, or why we need coral reefs! Learning to care for the Earth with our Kids Club is fun. There are monthly competitions and we invite kids to write to us and to send us drawings and stories about their environment. When they join, we give them a good quality Backpack, which would be really useful on those school holiday walks, hikes and rides that they may be planning.